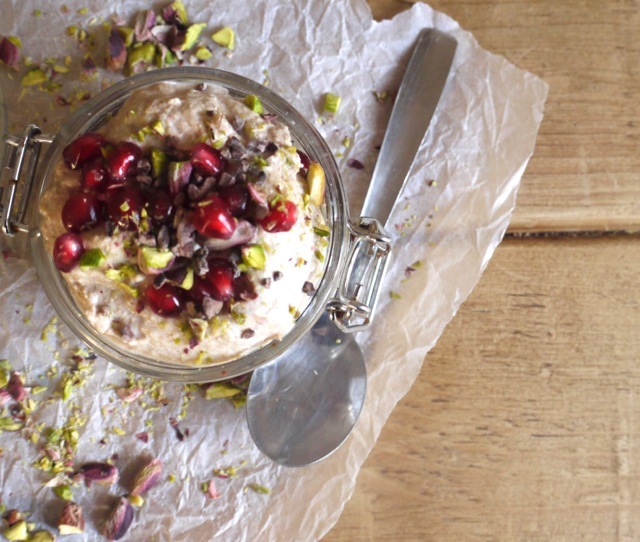 A dairy-free but beautifully creamy breakfast packed with toasty popped amaranth, crunchy pistachios, cocoa nibs and bursts of sweet pomegranate seeds, these bowls also double up as a delicious dessert. The almonds in this recipe need soaking for a minimum of 6 hours, so make sure to bear in mind when planning this recipe. In a medium bowl, cover the almonds with filtered water and leave to soak at room temperature for a minimum of six hours, or overnight. Drain and rinse. Combine the soaked almonds, fresh filtered water, vanilla, fleur de sel, honey and coconut oil in a powerful blender and blend 2 - 3 minutes until completely smooth and the consistency of thick yoghurt. Add a little more water if necessary. Spoon into a bowl and refrigerate for one hour. To pop the amaranth, place a deep, dry saucepan over a high heat. Once the pan is scorching hot, drop in 2 tbsp amaranth, cover and shimmy for 10 - 20 seconds until all the amaranth has puffed up or popped and turned white in colour. Be very careful as the tiny grains can easily catch and burn. 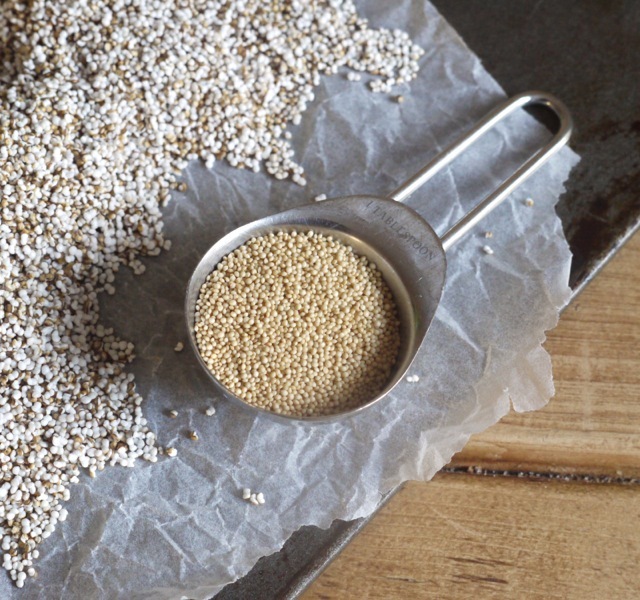 Tip the popped amaranth into a small bowl and repeat with the remaining grains. 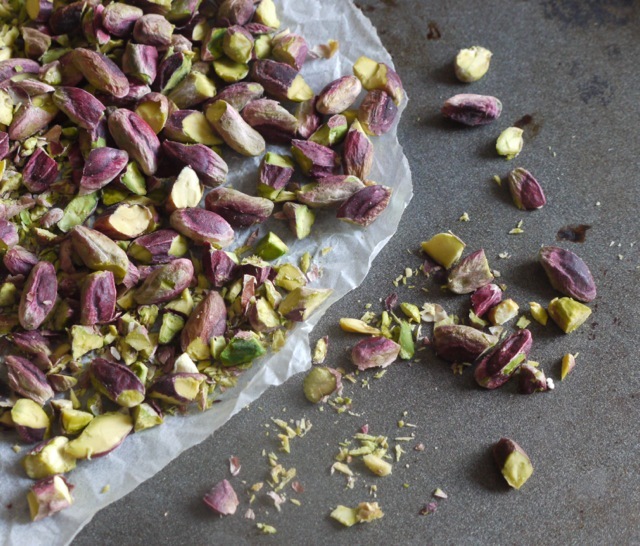 To assemble the parfaits, add the pistachios, cocoa powder and nibs to the popped amaranth and stir to combine. Take four small bowls or mason jars and spoon 3 tbsp almond cream, followed by 2 tbsp of the popped amaranth mixture and a handful of pomegranate seeds into each. 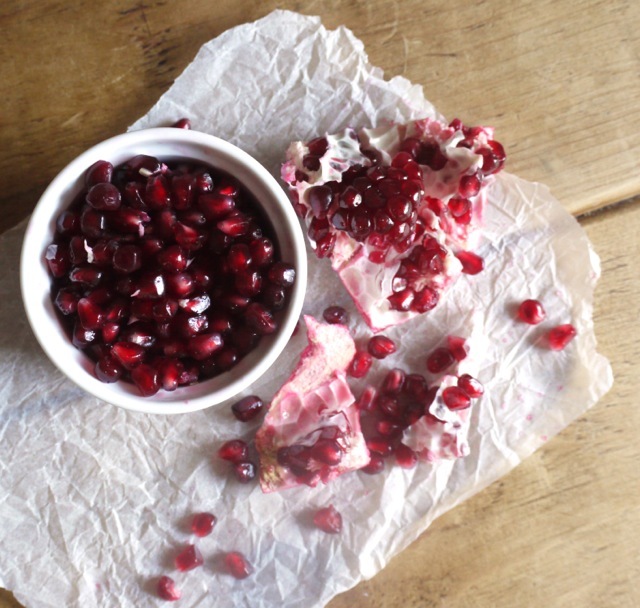 Repeat the layers again, finishing with a sprinkle of pomegranate seeds. Drizzle with a little more honey, if you like, and serve. In the book, Megan suggests popping the full quantity of amaranth in one go. I tried this and had to give up after 2 minutes of toasting when the amaranth was more brown than golden and not at all popped. Doing it in smaller quantities - as detailed in the recipe above - seemed to work much better for me. I'm sure it's because I'm a novice, but worth bearing in mind if you're new to the whole amaranth thing too. It’s a LOT smaller than popcorn (think popcorn for borrowers!) but it’s the same principle. It adds lovely texture to dishes – I want to try it coated in chocolate or inside peanut butter cups next! If you don’t know Megan’s blog, it’s well worth subscribing, her recipes and words are wonderful. My copy of this arrived last week too – isn’t it wonderful? So much inspiration in there! I love your choice of what to make from it; such a good combination of textures and flavours and so pretty too! That sounds wonderful and looks delicious….beautiful pictures. It looks so delicious and healthy! Lovely. 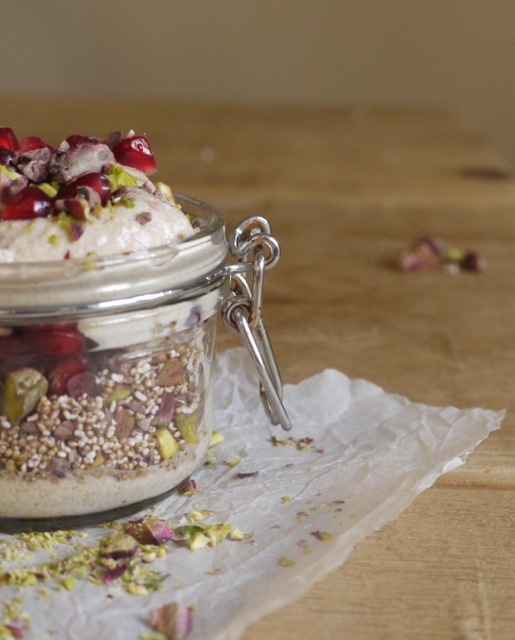 These parfaits sound like a total delight – so much goodness in one bowl! I hardly ever eat breakfast so this book sounds like just the thing to inspire me! I’ve never tried amaranth but it sounds intriguing, definitely going to hunt it out. 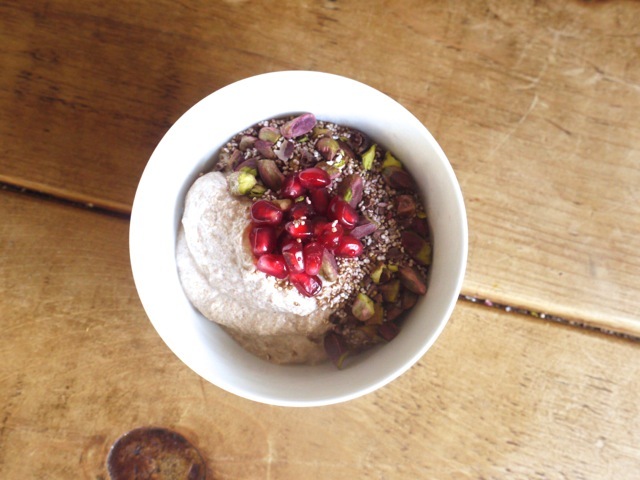 I have read so many great things about Wholegrain Mornings, love the name of Megan’s business too – Marge Granola! Your photos look super delicious too! Great job! Goodness, with recipes like this one, I think I’d want to be having breakfast for lunch and then again for dinner. What a crackin’ start to the day! I am constantly looking for something new and interesting to eat for breakfast. This recipe looks amazing and the cookbook sounds like one that I need to buy. Thanks for this! I am in love with all breakfast recipes, and this is no exception. This looks SO good! What an exquisite recipe. I can’t wait to get Meghan’s book. It looks sensational! This recipe looks really interesting – thank you for sharing. I’ve seen many bloggers over the last few years pop amaranth, so now I’m definitely intrigued to give it a try after my attempt of using amaranth flakes to make flapjacks last year. Love the new blog design by the way! Thanks Ceri! Popping the amaranth takes a little bit of practise – my first batch burned – but once you get the hang of it it’s so simple and delicious. I’ve been toying with buying this book after I saw a lot of blogger love for it (on top of the links you posted! ), well that and my love for breakfast above all meals! I think I’m just gonna have to give in and add another book to my overstuffed shelf. The recipe looks great! Stunning photographs! I love that you’ve served it in a jar, it would make a great breakfast on the go. I am going ot have to put that book on my birthday list! I love muesli for breakfast. I’ve never tried with pomegranate. This will be wirst thing in the morning I am gonna do, and the kids will be thrilled.